Re-cycling buildings for our clients is a popular request. Often clients can purchase an existing structure but must redesign it to meet their needs. 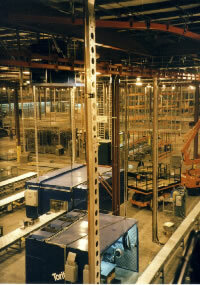 This 200,000 square foot structure in Texas was a pre-manufactured metal building. The client wanted to convert it to an automated paint line. Our firm designed the automated paint line supports through out the facility; added traveling cranes; reinforced the existing steel construction through out the plant; and made a very cost-effective plant location for service to this region of the nation. This food chain store building was selected for recycling! Our firm w as asked to redesign this building inside and out and create a new image, use, and functionality. The plan constraints of columns, ceilings and glass areas were elements of design challenges to overcome and blend into the design of the new spaces. Working within our client's budget, we selected native materials and simplified techniques to change the entire image of the structure. The community was amazed at the complete metamorphosis of the exterior and interior.